Yellow Transparent is one of the great American apples that, to the surprise of many, is actually not a true American apple! This apple, along with dozens of lesser-known selections such Duchess of Oldenburg, Red Astrachan, Lowland Raspberry and Alexander, was introduced to this country from Russia generations ago. In fact, Yellow Transparent is one of hundreds of Russian apples imported into the United States by the USDA in the late 1800’s as part of a program to introduce very cold-hardy varieties that could be raised successfully in the coldest regions of the Minnesota, Michigan, Wisconsin and the Dakotas. Some of these Russian apples gained favor in different parts of the country but few were embraced so quickly or fervently as Yellow Transparent. There are many wonderful qualities of Yellow Transparent that captured the fancy of the first American growers of this apple, chief among them being the tree’s ability to bear when very young and its capacity to produce heavy crops. 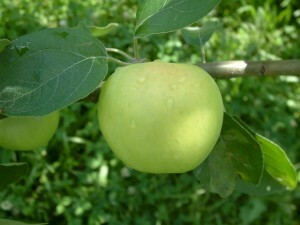 It is one of the first apples to ripen during the growing season, ripening mid-June to late July, depending on location. Here in the high mountains of NW North Carolina we usually prepare to pick our Yellow Transparent apples in mid-July. The freshly-picked fruits do not keep very well, usually just 2-3 weeks in the refrigerator. If left at room temperature you have maybe 2-3 days to enjoy the apples as they can quickly become dry, mealy and tasteless. Perhaps the greatest quality of Yellow Transparent that earned it such high favorability is its ability to be grown all over the country, even in the hotter, more humid regions of the eastern Coastal Plains and southern Gulf Coast states. From Maine to Mississippi, Yellow Transparent has demonstrated an outstanding capacity to thrive under very hot climatic conditions in which most other apples would fail. It is maybe a bit ironic that an apple first imported into this country for its ability to thrive in the coldest regions would also prove to be very successful in those areas where the heat and humidity normally discouraged any real possibility of raising apples! 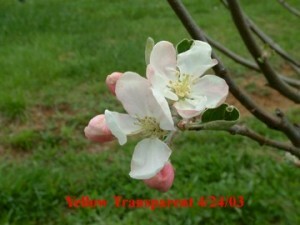 Yellow Transparent has fairly good resistance to most of the common apple diseases. It stands up very well against cedar-apple rust and apple scab, two of the more persistent and common apple diseases in eastern United States. It ripens so early in the season that it is not plagued with sooty blotch or flyspeck, common summer fungal diseases that create “blemishes” that mar the outward appearance but not the flavor or quality of the fruit. A couple of drawbacks of Yellow Transparent is its susceptibility to fire blight and tendency to bear biennially if not thinned properly. The flavor of Yellow Transparent has been described by some as “fair” or “lacking” but we enjoy the sprightly, tangy flavor of a slightly under-ripe apple. Pick it while still green for the best flavor. If allowed to turn white much of the quality has already faded. In 1930, a mutation of Yellow Transparent was discovered in Centralia, Illinois by Dr. D. B. Perrine. Named Perrine Yellow Transparent after its founder, the apple is larger with better flavor and ripens even earlier than the original Yellow Transparent. The trees are naturally dwarf and compact and are said to be more resistant to fire blight. Yellow Transparent is our second most popular apple behind Virginia Beauty and I can say with confidence that almost all the Yellow Transparent apples we sell will be used to make world-class applesauce. People rarely buy the apples for fresh-eating. It is the smooth, baby-food-creamy applesauce made from freshly picked apples that make customers line up at the Farmers’ Market when Yellow Transparent apples become available. It also makes wonderfully flavorful apple butter, especially when blended with other sweeter early varieties such as Early Harvest, Bevan’s Favorite or Carolina Red June. So, if you’re looking for a truly great “non-American” American apple(! ), then this Russian classic is well worth your consideration. Grow and enjoy! I was just referred to this website by a friend and fellow apple grafter/grower. Very impressive and informative website, so happy to find I can purchase Cornish Gilliflower scionwood from you. Order is on its way! Well, we’re just as happy that you’re happy that you found Cornish Gilliflower! Once we receive your scionwood request we will reply with an attached invoice confirming your order. We thank you sincerely for your kind comments about our website. We hope you enjoyed your visit with us. Yellow Transparent must be the same thing that we had in the Spokane Washington area 50 yrs ago. We all called them Early Transparent, maybe because they weren’t any good when they got yellow, I think that there was about a fifteen minute window when they were really good. Picked a little early and they were really sour or starchy and too late and they were like mush. The apples were small about 2 inch but they might get bigger if the owners had pruned and thinned. I would like to order a transparent apple tree, is that possible?